Weaver, John C.. "Hamilton". The Canadian Encyclopedia, 11 March 2019, Historica Canada. https://www.thecanadianencyclopedia.ca/en/article/hamilton. Accessed 18 April 2019. Hamilton, Ontario, incorporated as a city in 1846, population 536,917 (2016 c), 519,949 (2011 c). The City of Hamilton is situated at the west end of Lake Ontario, on Burlington Bay, 68 km southwest of Toronto, and 66 km west of Niagara Falls and the American border. As part of the reorganization of municipal governments in Ontario, the boundaries of the city were enlarged in 2001 to include much of the surrounding suburban and rural area, including the former towns of Ancaster, Dundas, Flamborough and Stoney Creek, and the former township of Glanbrook. 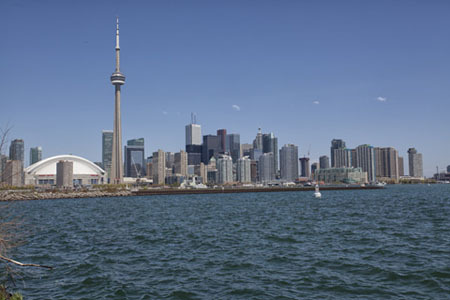 The city is Canada's largest steel producer and a major Great Lakes port. The area surrounding western Lake Ontario has been inhabited for approximately 6,000 years, and was settled by an Iroquoian-speaking Indigenous nation at least 650 years ago. Numbering between 20,000 and 40,000 by the early 17th century, they were known among the Huron as Attiwandaronk (meaning “those who speak a language slightly different from others”); however, following Samuel de Champlain’s description of them as “la Nation neutre” – referring to their neutrality in the Huron-Iroquois wars	– Europeans have generally referred to them as the Neutral Nation. Despite contemporary archaeological findings, relatively little is known about the Neutrals. The first European with whom they came in contact was most likely French explorer Étienne Brûlé, who arrived in 1615 or 1616. He left no written records of his encounter with them, though Champlain’s notes on the Neutral Nation were probably based on his account. Franciscan Father Joseph de la Roche Daillon visited the area a decade later and, in 1640–41, the Neutrals met two Jesuit missionaries, Father Jean de Brébeuf and Father Joseph Marie Chaumont, but by that time their numbers were already being decimated by epidemic disease. In 1650, the Iroquois	won a decisive victory over the Huron, and went on to target the Neutrals – possibly because they had given refuge to fleeing Hurons – and by the early 1650s their society seems to have disintegrated entirely. Throughout the next century, the Mississaugas	moved into the Neutrals’ territory and Lake Ontario was established as a sphere of the French fur trade. However, following Britain’s victory over the French at the Plains of Abraham in 1759, French influence in the region ended. In the late 1790s colonial officials sought to attract Loyalists to the Niagara region, and the Crown purchased large swathes of land from the local Mississaugas. Colonial administrators offered 200 acres to any Loyalist family upon arrival, but settlement was nonetheless slow. In 1815 George Hamilton – the son of businessman and politician Robert Hamilton, and a well-connected veteran of the War of 1812 – purchased a house and 257 acres of land in the small village then known as Head of the Lake. Hamilton rapidly laid out the town site by delineating roadways and selling parcels of his estate to newcomers. In March the following year, it was chosen as the administrative seat of the newly created Gore District and renamed in honour of its leading patron. Hamilton grew slowly until the late 1820s when a newly-constructed canal through Burlington Beach permitted schooners and steamers entry into Burlington Bay.With the access points for roads ascending the Niagara Escarpment, the canal transformed the fledgling community into a significant port. With enormous migration from the United Kingdom during the 1830s, its fortunes grew, in part because its location made it an ideal spot for mercantile houses, granaries and manufacturing establishments that could serve the surrounding region. Plans were made for a steamboat company, a bank and a railway to London. Hamilton emerged with the growth of the railway in the 1850s. 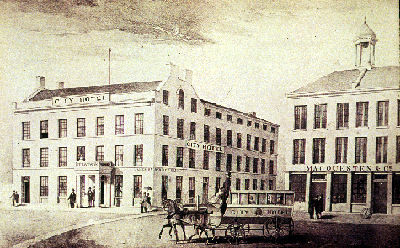 The large hotels and horse-drawn carriages indicate the new prosperity of trade (courtesy John Ross Robertson Coll, Metropolitan Toronto Public Library). An economic panic and the Rebellions of 1837 delayed the railway's construction until the early 1850s. Led by land agent and lawyer Sir Allan MacNab and others, the city bought into the Great Western Railway and other lines. Though the railway boom collapsed in 1857, it had attracted stove and farm-implement foundries, and in subsequent decades the town established other industrial businesses that would flourish into the mid-20th century. Ready-made clothing and sewing-machine manufacture developed there during the American Civil War, and by the 1890s the Hamilton Blast Furnace Company was producing pig iron. In the early 1900s, national railway construction and American branch plants serving the prairie market touched off a factory and residential construction boom that lasted until 1913. During both world wars, Hamilton industries concentrated on the production of war materiel, converting successfully after 1945 to serve the strong market for appliances, automobiles and houses. 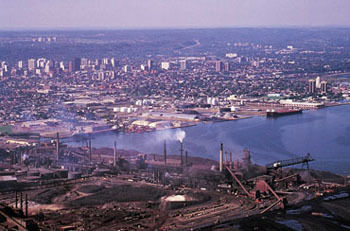 With the closing of textile mills and knit-wear plants in the 1950s and 1960s, Hamilton became increasingly dependent on steel and related industries. However, in the final two decades of the 20th century, manufacturers had to respond to increasing continental and global competition. Three of the region's largest employers, Otis Elevator, Firestone and International Harvester shut down their local operations, while others were forced to dramatically restructure their workplaces. Both major Hamilton steel plants reduced their workforce by nearly one half. In spite of these economic shocks, Hamilton did not become a decaying or depopulated "rust belt" city. Traditional manufacturing continues to play an important, if declining, role in the Hamilton economy and, as elsewhere, the service sector has continued to grow, as have some new recycling and waste disposal industries. Aerial view of Hamilton, Ont. The city's older industries are clustered along the waterfront (photo by Bob Anderson, courtesy SSC Photocentre). Hamilton Harbour (also known as Burlington Bay) extends 8 km west from the channel at Burlington Beach to the steep embankment of Burlington Heights. Until the end of the Second World War, the harbour and escarpment squeezed urban development along an east–west axis and the 100 m limestone face of the escarpment posed a considerable transportation obstacle to suburban development. The division between the "Mountain," as the escarpment is known locally, and the older city below continues to pose difficulties for urban planners, despite a series of expressways constructed in the 1960s and the Red Hill Valley Parkway in 2007. The city's older industries are clustered along the waterfront and Canadian National Railway tracks. Laboratories, parts distribution centres and light industries have been locating outside the city and along the highway corridors since the late 1960s. The cultural, financial and administrative core has remained near the corner of James and King at Gore Park, and in recent years the city has made a concerted effort to attract new employers to the downtown. 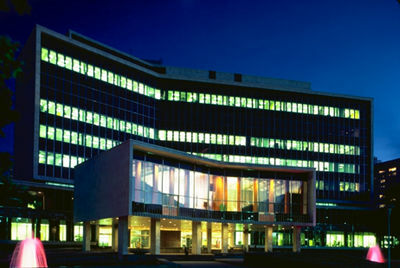 Those efforts have especially succeeded in expanding the city’s high-tech and research sectors, with the 2009 opening of McMaster Innovation Park — home to several laboratories specializing in everything from life sciences to industrial engineering — and the development of the Hamilton Health Sciences network. Residential areas include: the old elite Durand District between James and Queen; the innovative west-end middle-class community of Westdale; a combination of older village and newer developer subdivision communities in Ancaster, Dundas and Waterdown; and extensive working-class areas to the east and northeast. Ethnic neighbourhoods abound, usually in association with parish churches and small-business districts. During the 1960s and 1970s, the skyline changed as a few high-rise dwellings began to appear near the city's core and spread to adjacent areas. Though many handsome stone structures were lost in the construction boom, 19th-century structures such as the town halls in Dundas (1849) and Ancaster (1871), the Custom House (1860), Commercial Block (1858), residential Sandyford Place (1858) and the renowned St Paul's Church (1857) remain. Beginning in the 1970s, Hamilton's city council and harbour commission struggled to improve the harbour's water quality and to balance the needs of an industrial port with public demands for better environment and waterfront recreational areas. Since 2000, Bayfront Park, which opened in 1993, has become integrated into the Waterfront Trail on the harbour's southwestern shore. Some marshlands north-west of the city and sites within the harbour have been targeted for fish and wildlife habitat restoration, but low water quality has been cited as a major impediment to these projects. The city’s population growth has paralleled its economic cycles. After the Great Western Railway plan failed in 1857, Hamilton is estimated to have lost between 20 and 25 per cent of its population within the subsequent seven years. In the final decades of the 19th century, however, its economy and population grew steadily, largely driven by British immigrants. The phenomenal industrial expansion from 1900 to 1913 led to territorial annexations and attracted industrial and construction workers from the United Kingdom, the US, Italy and Poland. Refugees from central Europe and the Baltic States arrived during the 1920s. As elsewhere, the city’s growth was blunted by the economic hardship of the 1930s. During the Second World War, labourers from Quebec, the Maritimes and the West came to work in the war industries. After the war, European immigration (Dutch, German, Italian, Polish) reached a peak in 1954. Overall, industrial restructuring during the final quarter of the 20th century slowed the population growth of Hamilton, and the six surrounding municipalities incorporated into the new city have continued to grow much faster than the core of the city. Immigration also slowed during the same time period but continues to significantly shape the cultural makeup of the city. According to the 2016 census, people citing English origins make up the largest ethnic group, at 24.8 per cent of the population, followed by Canadian (23.7 per cent) and Scottish (18.7 per cent). Visible minorities account for 19 per cent of city residents, with South Asian, Black and Arab people making up the largest communities within this group. Hamilton is thought of as a highly-unionized, workingman’s city. The Nine-Hour Movement began in Hamilton in 1872, and the Knights of Labor and the American Federation of Labor (AFL) actively recruited in the late 19th and early 20th centuries. The Congress of Industrial Organizations (CIO) campaigned in the 1930s and 1940s for unions that would represent all men in a plant, and after serious strikes at Westinghouse, Firestone and Stelco in 1946, it concluded agreements ensuring higher pay and increased benefits. The newly-formed industrial unions and older craft unions merged in 1956 to form the Hamilton and District Trades and Labour Council. During the 1950s and 1960s, the unions secured wage increases, job security and vacation pay for their members. As elsewhere, the city’s labour movement gained new strength in the 1960s and 1970s when municipal, provincial and federal workers became union members, but was then weakened by the industrial restructuring and slower growth of public sector work during the final decades of the century. The city’s economy has undergone major shifts in recent years, which have been marked in particular by the continued decline of manufacturing, and the rise of information and health services. In 2003, the manufacturing sector employed nearly 80,000 people in the Hamilton area, (22 per cent of the workforce) while in 2013 that number had dropped to 46,200 (12 per cent). Following the announcement of the permanent closure of Stelco’s facilities in 2013, Dofasco now stands as the last remaining steel manufacturer in the city. The Hamilton Health Sciences Corporation, a network encompassing six local hospitals, is now the city’s largest employer, accounting for approximately 10,000 jobs. In total the health care and social services sector now employs 13.7 per cent of the Hamiltonian workforce, while manufacturing and retail account for 12.3 and 11.8 per cent, respectively. Hamilton's location at the western end of Lake Ontario has ensured it a strategic position within Ontario's	transportation network. 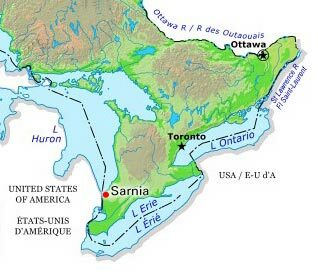 Southeast of the lake are the Niagara Peninsula and Buffalo, NY; northeast of the lake are Toronto	and eastern Ontario; and to the west are southwestern Ontario and Detroit, MI. Today, an increasing number of Hamilton residents commute to work in Toronto by car or via GO Transit. During the 19th century, rail lines and canals transformed the city into an important wholesale distribution centre. Beginning in 1912, the Hamilton Harbour Commission sought to transform Hamilton into a major Great Lakes port. Business at the port grew steadily throughout the 20th century, owing to the growth of the steel industry, the enlargement of the Welland Canal in the 1930s and the opening of the St Lawrence Seaway	in 1959. In terms of tonnes of cargo handled, the port ranks in the top 10 of the 200 ports in Canada. While Hamilton's railway connections have declined in importance, CN still maintains industrial freight facilities in the city. Manufacturers have come to rely increasingly on trucks, using an ever-expanding system of expressways that connect Hamilton to the Golden Horseshoe industrial district and the United States via Buffalo or Detroit. The city’s small international airport has taken advantage of the growing business use of air services. Since 1996 a local land development company, a construction trade union and an airport management firm have transformed the airport into one of Canada's largest nodes of cargo and courier operations. The arrival of WestJet has also ensured passenger connections to a growing number of Canadian and international destinations. The principles of Hamilton urban politics were established at the time of the incorporation of the city in 1846. Aldermen elected to represent wards in the community conducted business together at regular council meetings and in special committees. Mayors were appointed annually by the council until 1876, and thereafter were elected by voters in the city. Similar political systems were in place in the towns and townships surrounding the city. By the 1960s, however, the geographic expansion of the city to the edges of settled towns and villages, the growth of suburbs in the surrounding regions, and the demand for a high level of police, fire, road maintenance and sewer services in all of these areas led to a reconsideration of the political system. In 1974, the government of Ontario created a regional level of government to co-ordinate many services in Wentworth County and amalgamated several rural townships to create six municipal governments within the county: Ancaster, Dundas, Flamborough (formerly Beverly, East and West Flamborough), Glanbrook (formerly Glanford and Binbrook), Hamilton and Stoney Creek (including Stoney Creek and Saltfleet). This two-tier urban political system remained in place until January 2001, when the provincial government, seeking to reduce costs and restructure the delivery of municipal services, merged the municipalities into a single unit, the new city of Hamilton. A mayor and 15 councillors, eight from the old city and seven from the former suburban and rural municipalities, govern the city. Party machines with federal and provincial party connections have remained an important aspect of local elections. Though organized labour has endorsed a few candidates, unions and the parties of the left have not always had a forceful presence on city council. McMaster University has been an important city institution since 1930. Mohawk College, established in 1967, evolved from the Provincial Institute of Textiles, which later became the Hamilton Institute of Technology. In 1982, Redeemer University College — an undergraduate Christian liberal arts college — was also established in the Ancaster	area. 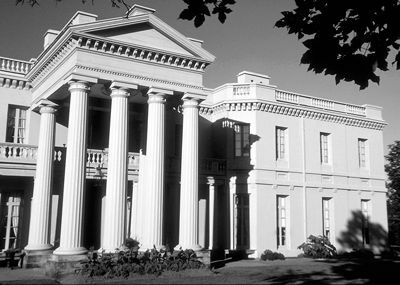 Sir Allan Napier MacNab's mansion still stands today in Hamilton (Corel Professional Photos). 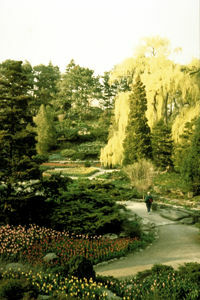 The Rock Garden at the Royal Botanical Garden, Hamilton (photo by A. Paterson). In sports, the city has shown a special interest in running, with the annual Around the Bay run and regular track meets. The city lost its National Hockey League team in 1924, and has been unable to attract a franchise since, although Copps Coliseum was constructed in the hopes of doing so. (In 2009 Jim Basillie, then co-CEO of Research In Motion, attempted to bring the bankrupt Phoenix Coyotes to Hamilton, but his bid was contested by the NHL, which successfully stopped the deal in court.) In professional sport, the city has one team, its beloved Hamilton Tiger-Cats, and is home to the Canadian Football Hall of Fame . 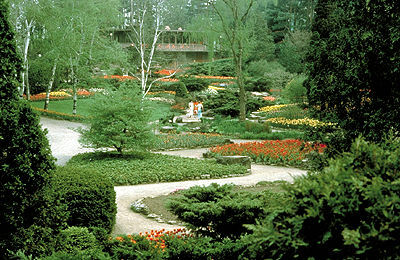 Royal Botanical GardenCheck out the beautiful landscapes at the Royal Botanical Garden in Hamilton. HamiltonOfficial website of the City of Hamilton. Offers information for residents and visitors to this Ontario city. U.S. Steel closing steelmaking operations at Hamilton plantA 2013 article about the demise of iron and steelmaking operations at the old Stelco plant in Hamilton. See also a brief timeline of steel-making in Hamilton. From thestar.com.